In his interview of Sean Hannity of which Ted Koppel only released a few seconds from an hour long examination of Hannity and conservatism. 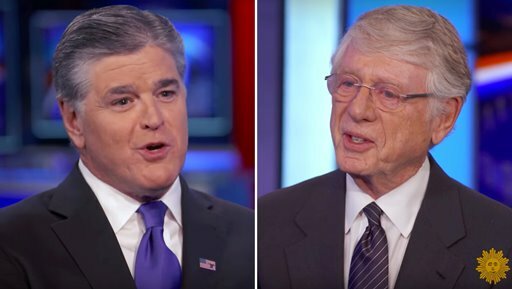 Koppel’s only segment was not one of Hannity, but of himself expressing his utter contempt for conservatives whom he apparently sees only as brainless fools who don’t believe in truth or reality. This statement is actually the perfect definition of liberalism and their pundits. But in Koppel’s mind liberalism, leftist ideology is not an ideology, it is righteous thinking and any thought outside of what leftists profess is warped, twisted, and corrupt. So if you believe in God, in Christ, in truth, in examining both sides of the argument presented by liberals and conservatives so you can exercise critical thought, then you are living in an unreal world devoid of facts. He thinks anyone who is not a liberal does not believe in science that he believes has proven God and Christ do not exist, that evolution is fact, that their political lies are gospel truth, and their dysfunctional application of the facts is proper thinking. Koppel is a prime example of dysfunctional leftist thinking that presents their distorted world view as the only righteous opinion people are allowed to have. Liberals and conservatives both have access to the same facts, but come to opposite conclusions based on those facts. Much of that has to do with ideology of both the Left and the Right. People of both the Left and Right believe the other side to be dysfunctional thinkers, unrighteous, and insane. But how do you know which is right and which is wrong? The righteous analysis is found by investigating what rightwingers call liberal hypocrisy and what leftwingers call conservative hypocrisy. For example, when Donald Trump says he was wiretapped by Obama, and Republicans believe him despite those who say there’s no evidence of wiretapping, (which they declare on the basis that no one cuts into the wires of cellphones because they don’t have wires) leftists call them hypocrites. But Trump supporters understand that he is talking about being under government surveillance, and the proof of this is in the liberal media’s own reports obtained through leaks by Obama operatives in government who admitted as much. So when liberals call them hypocrites believing in fantasy the truth is already revealed that they are the lying hypocrites. Likewise, when Obama said, “If you like your doctor, you can keep your doctor,” and that ObamaCare would be “cost neutral,” reduce costs, and not be offered to illegal immigrants, conservatives said those were all lies and that ObamaCare would implode, leftists smeared them as liars believing in fantasy. Now that the truth has come out on both issues, that the Trump campaign was under surveillance by the Obama regime supposedly investigating a Russian connection, and that millions of people lost their doctors, had their premiums skyrocket, seen ObamaCare offered to illegals and add trillions to the National Debt, the truth of which ideology deals in righteous truth and which deals in deceptive lies is revealed. But true deceivers do know that they must live by one certain truth – “You die with the lie.” Leftists will never admit that Obama was committing a crime a thousand times worse than Nixon, which is why they scream and panic at Trump saying he will investigate it. They will never admit that Obama seeded operatives throughout the government to sabotage Trump. They will never admit that they knew Obama was a Moslem Trojan Horse who would impose their socialist agenda on steroids, that Democrats work only to overthrow the Constitution to establish themselves as America’s socialist dictatorship. It is up to you to follow the bread crumbs and wade through all the misinformation to uncover the truth. Truth is always exposed over the course of time, but that does no one any good when making a decision today. What you must do is take the time to examine the history of the truth as told by the Right and the Left to discover which speaks truthfully and which is proven false over time. Conservatives want you to listen to both sides to discover for yourself which is lying, while liberals will tell you not to listen to the opposition and tell you they just lie so you won’t discover the truth for yourself. Just as every prediction the Left has made about global warming has failed to come to pass and all their facts have been proven false, all their conclusions proven wrong, so must you apply that knowledge to all things leftists say. And you must do so with the understanding that the Left infiltrates the Right to corrupt the truth in order to smear them as being more wrong, e.g. RINOs like McCain who so often takes sides with Democrats. A good rule of thumb is to believe only half of what Republicans say and none of what Democrats say until you are able to examine the facts and reach your own conclusions. When 95% of the media contributes to Democrats who believe in stealing from the rich to give to their cronies, of whom the Mainstream Media is one as their propaganda machine, it should be clear there is a massive bias problem with anything they say. When you also understand that 90% of media people are atheists and anti-Christians while 85% of Americans believe in God and most believe in Christ then that should clue you in to who tells the truth and who is deliberately attempting to deceive the people. Whether or not a liberal is deluded is irrelevant as their leaders are those who are deliberately deceiving them. And the LDMSM (Lying Democrat Mainstream Media) is their voice that wants to squash the voices of the Moral Majority, which was previously the Silent Majority because leftists do not what righteous thought to be expressed and examined. As in all things political, if you follow the money to the source then you will find the truth of who is endorsing what agenda. Leftists do not what the people to listen to righteous common sense thinking because socialism does not stand up to critical examination as it always fails. Those who believe in it are not promoting liberty, but slavery to the state. And they are willing to perpetrate any fraud in order to dupe the people into following them even to the point of promising to steal from the rich to give to the poor, but that money only ends up in their own pockets. They only do this because they lack sufficient strength to overcome the people by force, which is why they are now putting their hopes in Islam that uses terrorism to intimidate those who refuse to submit to their will. Sanctuary Policy's Rotten CoreJudge Napolitano is Back on Fox News and Doubling Down on Reports that Obama was Spying on Trump!